Full moon (supermoon) in Aquarius August 10th. New moon in Virgo August 25th. The past plays into your future this month and appears to be a lynch pin connecting home and work. 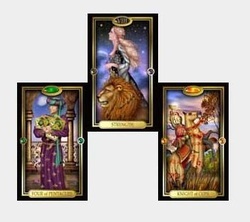 Love & Relationships: If you’re single these cards highlight someone with roots in your past and that you felt a close connection with, so it seems there could be some unfinished business of the romantic variety. However, this time round you could actually get things off the ground and develop a relationship together. It doesn’t necessarily show someone you’ve previously been romantically involved with but you would have been good friends. What may surprise you is how easily you seem to click, as though no time has passed at all. This meeting of hearts and minds may make you wonder how you missed it previously. The passage of time should have made you both wiser, so don’t waste this wonderful opportunity to forge something even deeper and quite special. For those who are settled, people or places from the past will play a large part in home and family and provide the backdrop for some sweet moments with your partner. Second honeymoon anyone? Revisiting old haunts could make for a special time where you can forge some new memories to look back upon fondly. Old friends may surface or relatives you haven’t connected with for a while could see you visiting your old neighbourhood or previous playgrounds. Whatever past connections surface for you this month, they will have a positive impact on your relationship. August is a good month to reflect upon those things that strengthen your bond. Career & Business: Are you considering reassembling the old gang, or forging some form of partnership with an old colleague? The Two of Wands gets the ball rolling with new ideas taking shape as you collaborate with others. Whether you’re in business or employed, look to old contacts or customers for promising leads that could now become established. If you’ve been trying to get a new project off the ground, or launch yourself in a particular direction, you should be able to make good progress, sufficient to gain some traction and get things moving. 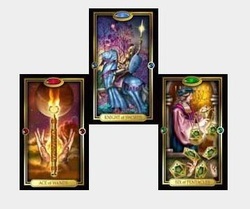 All forms of partnerships are connected to the Two of Wands, formal or informal, so there’s a strong indication of working together with others. Negotiations could also prove significant. Bear in mind that the key to your accomplishment is somehow linked to the past. 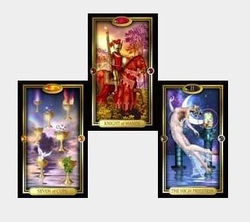 New beginnings still surround the Taurus camp with the Ace of Cups as the Key card, affecting both areas. It appears to be a continuation of all the new things shown from last month, so whether or not they showed up on your radar they’re still on the horizon; more likely they should now be taking centre-stage. Love & Relationships: The Ace of Cups to the Wheel brings about change and, with this combination, definitely of the positive variety. If you’re single this may be set to change, regardless of whether you were considering such the potential’s shown, as always it’s up to you if you decide to take it. It’s certainly worthy of your consideration though because it could open up a whole new world. For those who are settled a whole new beginning sits before you, it promises to bring happiness for everyone concerned and opens a set of doors where life should feel as if it easily flows in the slipstream. The Wheel of Fortune is the card most associated with fate and destiny, where luck steps in to lend a hand and opens a new chapter; a cycle of opportunity and gains. Make the most of it while it lasts! Career & Business: You have the chance to make your mark in the workplace and receive recognition for your talents in the process. It’s a case of getting on with the job or work in hand now, but this shouldn’t deter you as the Three of Pentacles indicates work that you’re good at and enjoy. If you’re in the market for a new post, concentrate on areas where you know you excel or work that you have a natural ability for, as this will reap the best rewards for you. If you’re mid-project, now is the time to add the final touches and polish things until they shine. Through your efforts success will begin to show, bringing a sense of achievement with the initial stages completed. Your efforts won’t go unrecognised this month. The Three of Pentacles represents a certain mastery, so it’s not usually work that is completely new to you but provides the opportunity to turn out work that you’re proud of and should see rewards for your efforts. Love & Relationships: You may be displaying a certain amount of caution concerning relationships of all stripes. You seem quite determined about it too, so there’s probably little anyone can say to change your mind on that score, and perhaps you are right to feel so inclined. However, do guard against being over-cautious as you could miss an opportunity in the process, so don’t dismiss someone, or something, out of hand too quickly. Career & Business: There could be some interesting offers or proposals coming in through work, which is handy if you’re in the market for a new job or project. If you’ve been thinking about changing your position, (or chasing new business if self-employed) these are excellent cards to help you achieve your aims. Quiet resolve is expressed through Strength, and should provide as much dogged determination as you’ll need, not to mention some diplomatic charm to help you sweet talk your way through what may otherwise seem as closed doors. Whether you’re looking for new work, trying to get onto a course, or make headway in an existing position, throw all your efforts behind your campaign and offers should follow. You probably hold more inner power than you realise, so gather it all together as you can make great strides this month. 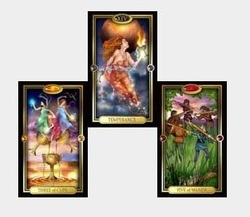 Love & Relationships: Home and romance are well-aspected this month and the Eight of Wands should bring a flurry of exciting news, possibly even a trip along the way. If love has been a little difficult or trying of late then The Star should bring some renewed hope onto your horizon to chase away the clouds; life will certainly show some relief and improvement. News received is of the promising variety and perhaps just what the doctor ordered! 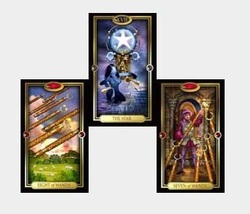 The Star indicates hope and optimism for the future whilst the Eight of Wands signals movement or simply moving on and forward, which will be good news if you’ve experienced setbacks or delays. Socially, this is a good month, and travel by air could also feature. There should be plenty going on to keep you occupied, and if you’re single keeping busy could lead to more than just fun times. The Star brings healing to past hurts and can help open your heart to find new love. Stay open to possibilities as there should be quite a lot happening around you. Career & Business: Something could rattle your cage slightly, at least sufficient for you to feel the need to defend your position, or regarding something you feel quite strongly about. Perhaps it’s time to make a stand or oppose something that doesn’t sit well with you. It doesn’t mean you have to take an aggressive stance but it does indicate having the courage of your convictions, to stand up and be counted. Meanwhile, the calm influence of The Star shines brightly in the background, so although you may meet with opposition, both these cards show that you can win through and overcome any obstacles. Remain calm if faced with adverse conditions, have confidence in yourself, and state your case with calm rationale. If you feel your back’s up against the wall then now is the time to come out fighting, in a metaphorical sense. When life throws down the gauntlet sometimes we have no option but to pick it up. Be brave in spite of yourself, as these indications show things should go in your favour – sometimes we need some fighting spirit to jolt us into action. Love & Relationships: Some Leo’s would have already had their birthday but for some it’s still to come, yet these two cards seem to be a bit of a damp squid on what should be the regal sign’s time to shine. Something connected to home or love may be put on hold, and you don’t seem too happy about it. The Hanging Man can be a frustrating card, since it usually means nothing’s happening (often when you want it to) which would explain why we see the discontent found in the Four of Cups. The Hanging Man can also turn things on their head, causing a reversal of plans or an about face. In itself, this card recommends a rethink, so it may be that you need to change your strategy and considerations regarding a liaison or certain plans. Time for some lateral thinking in the Leo camp, so try to step right outside of the situation and see things from a completely fresh perspective in order to find a way forward. There is a small warning of sorts with the Four, in that you need to be careful you don’t miss something good due to a feeling of nonchalance, so there’s plenty of food for thought this month. Career & Business: Family responsibilities show a strong connection to work, although for most, work is usually the source for paying bills on the home front, or those little luxuries that help make the world go round. Family members or even a family business could also be prominent, as this is a card of family values. 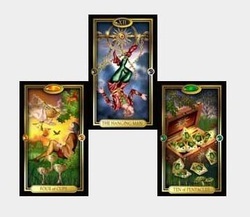 The Hanging Man seems to suggest some new perceptions in order to bring more stability to work matters and, if you can do so, the Ten of Pentacles would bring a pleasant increase to financial matters to put everything on a firmer footing. To move past the current status quo you may need to put your thinking cap on, but not in the conventional way, which is useful if you need to stand out from the crowd. You can make good gains at work this month, which in turn will help home and family, so don’t be afraid to think outside the box. All change. The Death card brings major change onto the horizon. This is interesting, because it’s the month before your birthday and rather like slipping into the dark side of the moon, the moment before rebirth. My sense with this card is that it’s a month for letting go of those things that no longer serve you. Love & Relationships: Overall there are three major arcana cards for you this month and The Hermit is associated with the sign of Virgo. It indicates a time of introspection and deep thought as you contemplate matters concerning home and those closest. You may find you’re not feeling particularly sociable, preferring to retreat from the crowds as you organise your thoughts and plans for the future. These two cards go well together and seem to suggest a good deal of food for thought as you clear the metaphorical closets. A new brush sweeps clean, and you’re clearing the decks in preparedness for the annual return and your new birthday year that lies not far ahead. “Don’t push the river, it flows by itself,” as the saying goes, so if any changes come along that didn’t feature in your plans, just ride with them rather than push against it. The Hermit serves you well, with his wisdom and philosophical outlook, if you listen to that still calm voice within you’ll find the answers that you seek. 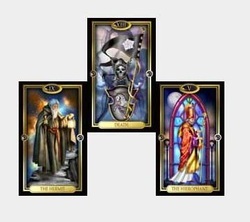 Career & Business: The Hierophant suggests large organisations or institutions, indicating structure, order, and a set way of going about things. There’s a sense of conformity, convention, and traditional values, often where it’s difficult to implement change – which is interesting since the Death card brings us to The Hierophant. You may receive help or guidance this month from a wise and trusted person, or someone you regard as a mentor, and these are good cards if you’ve been considering undertaking a period of study, whether with an institution or on a private basis. This card can often indicate educational establishments, hospitals, government departments, churches, or even large corporations in the private sector, so any of these may feature or be relevant for you. If you’re looking for new work then cast your eye in their direction. There’s a general feeling that your hands are tied and it’s difficult to release yourself from a restrictive situation or something that’s holding you back. At least that’s how you feel, trouble is, no amount of cajoling may persuade you otherwise, as this is something that needs to come from within. 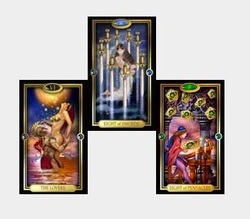 There are good cards in both areas but unless you find a way to release the shackles that bind you to these mental monsters it will be difficult to fully realise the benefits. This may be the month to face your fears head on so you can enjoy what’s on offer – it looks pretty good! For those more settled, it may be that the two of you are facing a situation surrounding home that will require a united front to break past some kind of restrictions or limitation…together you can make decisions and choices and find a solution! Career & Business: The Eight of Pentacles suggests a new job, if you’re looking, but also provides the opportunity for you to polish up your skills and hone your talents. Learning and studying come under this card, so this is a good time for taking a course or learning something new. If you’re self-employed it may bring new business, new clients, or possibly a new project. Don’t let fears or ‘what-ifs’ stand in your way of making a new start. Two eights also show the flow of infinity, so there’s plenty working in your favour to help you eradicate your fears found in the Eight of Swords. With so much potential in the offing this month it may finally be time to deal with your demons. Love & Relationships: It looks as though you’re on the move, whether moving home or taking a trip, it’s just that you could feel beset with options – which one to choose? A nice dilemma to have! The Seven of Cups can feel slightly overwhelming as you chase your thoughts down each rabbit hole, just be aware that your imagination could be on overdrive. 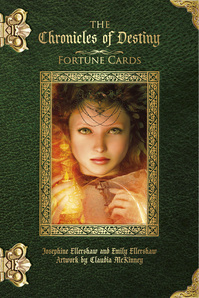 It’s important with this card to check your thoughts against the facts, before making any big decisions. Don’t settle for maybe, or what you think something to be, work only with the facts and everything will be fine. Whether it concerns choices concerning a relationship, or choices regarding more than one relationship, the place you call home, or just where you’re taking your holiday – the cold hard facts will make a difference and count this month. Whilst you may be in dreamy mode just try not to dither and end up empty-handed. 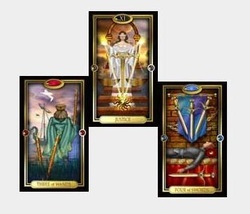 Career & Business: I’ve often found the Knight of Wands in someone’s work area turns out to be a relocation of some variety, whether changing your office or a move further afield. It doesn’t represent a different company just a change in wherever it is you do your thing! The High Priestess is not very helpful to us here, since she has a tendency to stay tight-lipped until she’s ready for the big reveal – in her own time, not ours :) This makes everything start to sound like something of a conundrum, because it’s a bit of a secret! The good news is that she usually brings information that will be to your benefit, and at just the right moment too. The High Priestess is like the “Aha!” moment, when something suddenly becomes crystal clear, a piece of missing information that suddenly makes all the dots connect. This is also an excellent card for those who work in spiritual fields, or wish to pursue deeper wisdom and training in that direction. You may seem more reflective or feel the need to explore deeper subjects at this time, so listen and trust your intuition, as the High Priestess may be whispering her secrets to you. Getting to where you want to be isn’t always easy, inevitably it usually takes some effort, but with these cards it’s on the way and possibly just at the moment you were about to give up – so don’t! Love & Relationships: Happiness in the heart department comes along for you this month. If you’re single a new relationship will make quite an impact and has the potential to become something more serious. If you felt like giving up on the dating stakes just try one more time, it could be the next one... but it’s out there somewhere, hovering on your horizon. For those who are more settled, home and hearth provide contentment for the weary soul. You may feel your nearest and dearest test your limits sometimes, but moments like these tend to put things back into perspective. There’s no other place you’d rather be, so enjoy this time with those who mean the most to you and bask in the rosy glow. Love and feel loved. Career & Business: If things have been a bit tough at work August looks set to change the pace. The Six of Swords indicates moving out of stormy waters into calmer times, so things should start to improve soon. There’s just a little bit further to go and then you’re into a good clear stretch, leaving difficulties behind. The important message with the Nine of Wands is to pull everything together for one final push forward, even though you may feel your reserves are running on empty this is the very moment when you need to keep going, it’s the ‘almost there’ card. You’ll be able to ease up shortly, so even if it feels as though you’re following the proverbial carrot on a stick, you’ll soon be able to sit back and snack! Love & Relationships: Temperance combined with the Three of Cups brings harmony and emotional balance to the Capricorn camp this month. Celebrations with family and friends, possibly a wedding or reasons to party with those closest, all surrounded by the beautiful harmonious aspect of Temperance (no family arguments in this one, although at times patience may be required). The Three of Cups provides an atmosphere to enjoy the company of others and a toast with your favourite tipple! Overall, it’s a good month for relationships, where progress can be made, bringing emotional growth and happiness. If you’re single, accept opportunities offered to socialise or attend group activities; it’s also possible to meet someone compatible at this time. On the home front there may be a sense of abundance and achievement. Family get-togethers are well aspected. 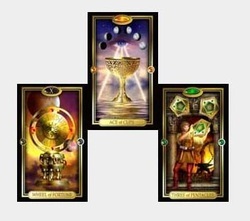 If there have been rifts with a friend or significant other the lovely influence of Temperance, together with the Three of Cups, brings the right atmosphere for old wounds to be healed. 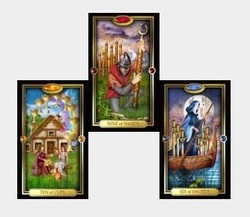 Career & Business: Patience may be needed in the workplace as the Five of Wands indicates petty obstacles and it may feel as though it’s one thing after another. If you’re self-employed or interviewing for a new position, do your homework, as this card usually shows that you could meet with stiff competition. Meanwhile, colleagues may not be in the most helpful mode of thinking and bickering with one another. The good news is that the Five of Wands is annoying rather than insurmountable, and you have Temperance working in your favour. At times it may feel as though you’re the one keeping the peace, diplomatically helping to find compromise and solutions, but it will win you brownie points with everyone in the long-run – just don’t be tempted to get drawn into their disputes. If you’re hoping to present new ideas for a project you may find it more difficult to get everyone on board this month; if possible, try to save anything of this nature for another time. Love & Relationships: Legal documents or anything associated with the law may require your attention this month but, on a general basis, Justice suggests you may find yourself to be the calm voice of reason, or even mediating in other’s disputes. With home and relationships it’s a good month that brings some progress, not huge, but sufficient for you to be able to build upon. Success is a series of smaller steps and this helps to propel your enthusiasm and gather momentum as you go. This will come as good news if you have any form of legal contracts around you at the moment, since it shows matters moving in the right direction! Plans should come together well, providing some optimism and excitement as you look further down the road and set your goals in motion. In home and relationships you may find it’s more ‘matter of a fact’ rather than hearts and flowers, but life moves in cycles and it’s one of those periods where the daily stuff matters, so don’t discount it, you can gain good ground in the long run. Career & Business: If you’re self-employed or have your own business this is a good month to consolidate your assets, or pull your resources together and regroup. The Four of Swords indicates a time of rest and recovery after strain, so try to take some time out, book holidays, or make the most of your downtime. If you’ve been dealing with anything of a legal nature, or contracts, there should be cause to be able to relax back a bit, if it’s been tense over this then the worst is behind you. Time to rejuvenate and get back on track, slowly but surely; be kind to yourself. Justice sitting overhead brings a good degree of balance but it may feel rather sober and serious as it requires a balanced mind, being logical and rational, practical and realistic, but it’s all a question of balancing those scales to a place of equilibrium and you can achieve that this month. You’ll need your running shoes as August promises to be a fast-paced month across the board! 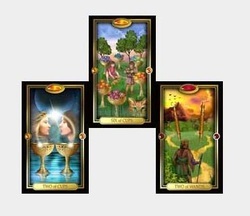 Love & Relationships: Exciting new beginnings are indicated with the Ace of Wands. The sky’s the limit; pick your favourite poison (so to speak) as it could represent a new job or project, or even a whole new way of life for some. If you’re single, new relationships hold an extra dose of passion and things will take off at quite a pace. The Knight of Swords adds his own brand of speed, so love could land like a whirlwind and sweep you off your feet - breathless stuff! Needless to say, whatever comes in it will do so at a rate of knots and you’ll need to be ready to roll if you want to make the most of it. The energy from the Knight of Swords doesn’t tend to hang about, it swoops in with such speed it can feel almost chaotic but it brings wonderful new beginnings with it. Be ready! Career & Business: Money owing could be paid or you may find yourself the recipient of someone’s generosity, hopefully the boss, as it’s a good month for financial increase. This card follows hot on the heels of the Knight of Swords, so you know the drill by now, and could find yourself dashing about the place but it will bring rewards. If you’ve been waiting for funding, applied for assistance, or a much-needed late payment, then August should bring the funds. The key word this month is speed, even if it arrives at the last minute, once things happen they do so with gusto. These are excellent cards Pisces, so make the most of it whilst you can, you can always rest up later.